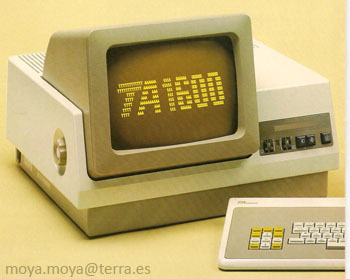 The TA 1600 system was introduced in 1983 at the CeBIT (which was only a part of the "Hannover-Messe" by that time). TA showed a few sample applications and the 1600 family in general. Triumph Adler's hardware included also the 1600/20-3 which was supplied with a permanent-swap-HDD-unit. This unit had a memory/storage capacity of 2 x 8 MB (Winchester technology). Triumph Adler said the system (the 1600) will fit the demand of medium-sized businesses, due to the facts that these companies will need more storage capacities and much more flexibility at the external storage solutions. For the 1600/20 as well as the 1600/30 models were new 64 KB chipset modules available which extended the RAM to a maximum of 1 MB. Software on the 1600 systems had the focus on the classic office computing (EDP). The standard package was called "TABS 1600" and included applications like, payroll accounting, stock management. But also, there were applications for special businesses available. The pricing of the 1600 family started at 13.000 DM (German Mark) for a single system up to 250.000 DM for a "Multi-user-dialogue-system". KEYBOARD Kind of mechanical keyboard ? see more Triumph Adler TA-1600 Ebay auctions !